Transform student lives through innovation and applied research. Make connections with educators throughout the state, region, and other countries! Listen to our podcast . "Video based lectures, Group projects, Audio recordings, and Learning Management Systems (LMS) all seem to support learning in a more organized and fluid fashion than what I experienced in my traditional undergrad program. As someone with a full time job, 4 kids, and a "life", I must say that thus far the DE end of this program has been transformative in my own personal learning and that of my students." "Thank you for your awesome instruction. I really love this program, and what I've learned. It has really impacted my whole teaching style. I feel like my classes run more like vibrant 'workshops' than staid classrooms. It's pretty liberating! I love it. An engaging, highly interactive learning environment connects you with classmates and faculty through online small-group discussions, and through communication tools like Google Hangouts, Flipgrid, Twitter, and more. This means you're not tackling a rigorous, online master's program on your own. Explore course content through various media. You learn from faculty who are both experts in educational technology, teaching and learning. and in teaching online. Our faculty have experience teaching in PK-12 through higher education. This translates into well-designed courses – a blend of theory and research – with real-world application. Research, projects, and coursework address important educational issues. What you learn today, you can incorporate into your classroom tomorrow. In our cohort-based program, you get to know your peers by taking classes together in a scheduled sequence. Our students value this approach because it facilitates problem-solving and sharing professional knowledge they can bring to their own classrooms. 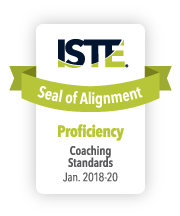 The program is the first graduate program in educational technology aligned to the ISTE Coach Standards. 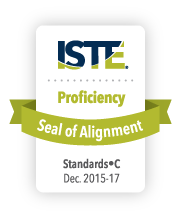 The program went through an extensive review from ISTE . Our program is highly collaborative by design. Learning and working with professional peers enhances your learning experience. You also establish valuable networks that last well beyond the program. We have a vibrant alumni community that provides opportunities for on-going collaboration and support. You can expect personalized attention and support throughout the program. Interactive features enhance access to instructors when you need assistance. Our students say that's unmatched by anything a traditional classroom offers. This site is maintained by Educational Technology. To report problems or comments with this site, please contact ldonovan@fullerton.edu.